Some time ago, I came across this "Jet" magazine on E-Bay. As a former jockey and historian, I bought it quickly and placed it with my giant collection of women jockey racing articles. At one time I worked with historian/writer Jim Bolus at Keeneland Race Course and we talked about working together to write a book "Women Jockeys, an American History". Sadly, Bolus died suddenly and my project has been on hold since. In my travels, some years back, I was searching for an early female jockey, Cheryl White. I heard she galloped horses at Del Mar, so in two trips there tried to catch up with her, but she is fast as a race horse, and I was not able to locate her for a photo and interview. This winter, I came across that copy of "Jet" with Cheryl on the cover, made some inquires to racing entities in Norhern California and they passed my e-mail address and phone number along to Cheryl White. "I've been looking for a copy of that magazine forever!" exclaimed the now, racing official. "I want it!" I responded that I could not possibly part with this gem of my collection, but finally agreed that Cheryl was the person who deserved it after all. "On one condition," I cautioned my new friend, "You must will it to a racing entity that will preserve it for history — the Kentucky Derby Racing Museum, the Kentucky Horse Park, or the Racing Hall of Fame in Saratoga." Cheryl quickly agreed. I had worked as Senior Staff Writer for Turfway Park in the early 90s, Cheryl was raised not far from there. She came from racing stock. Her father, owner/trainer Raymond White, was successful at Ohio and Kentucky tracks, and had even run two horses in the Kentucky Derby. Her mother Doris White, also owned race horses, and Cheryl won 5 races for her mom in the span of a month, after her mother's horses had suffered a long dry spell. A star was born. 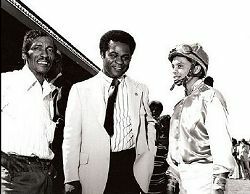 Trainer Raymond White, sportscaster Ken Jones of KTLA, and jockey Cheryl White Clerk. Photo copyright Bill Mochon. Cheryl did well at the small tracks in the area, but after a visit to California, she packed her tack and moved West. Few women, even today, have had success in the tough riding colonies of California, where women were not quite encouraged to ride in races. "I was just a race track brat when I started riding, so it wasn't the advantage you might think. People from where I grew up, didn't take me as seriously because they knew me as a kid," Cheryl recalls. After some discouraging attempts ridding at Santa Anita and Del Mar, she went to the Northern California circuit and found success. In 1969, Olympic rider, Kathy Kushner won the legal right for women to ride in pari-mutual races, prior to that there was no lady's locker room at recognized tracks. 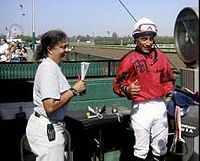 From the start, it would prove to be a tough road, as Kathy was injured before she could ride that first race, in her place, Barbara Jo Ruben's trainer halted a male jockey boycott and his rider became the first woman to ride that recognized race. Barbara Jo Ruben then became the first American woman to ride and start the tide. Fifth win of the day for Jockey Cheryl White. Fresno Fair, horse “Montfort”, a 10-year-old making his 100th start. Photo by Joe Visco. Cheryl was one of racing's pioneers. 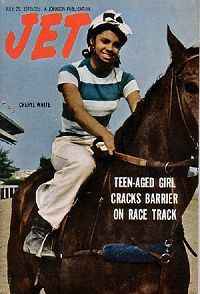 It was reported by one source that Cheryl was one of only three African American jockeys in America at that time. On October 19, 1983, White became the first female jockey to win 5 thoroughbred races in one day at a major track. "The last winner I rode that day was Montfort, a 10-year-old, and making his 100th start," she laughed. Her accomplishments came at Fresno Fair in Northern California. The year she appeared on the July 29, 1971 cover of "Jet" magazine was a year to remember. Cheryl shared the covers of "Jet" with such illuminates as: Civil Rights Activist Angela Davis, boxing champion Muhammad Ali, entertainer Sammy Davis, and Congressman John Conyers. She garnered enough attention as a jockey to become invited to the "Boots and Bows Handicap", and all ladies' race in Atlantic City August 28, 1972 . Cheryl, on the longest shot from a field of 14, won the race. Jockey Mary Bacon was angry at losing the race and accused Cheryl of trying to come over on Mary's horse. "I couldn't have dropped her if I had wanted to," Cheryl explained, "I think that set her off." "I remember Mary and Cheryl having words," said former leading female jockey Patti Barton Brown. "They didn't fight, but Sandy (Schelifers, jockey) stepped in and calmed down the dispute." 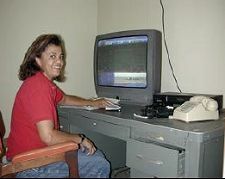 Racing Official Cheryl White at work on the computer. Photo by Joe Visco. "In my career, I rode about 750 winners", said Cheryl recently, the list includes Thoroughbred, Quarter Horse, Arabian, Paint and Appaloosa races. "I was leading Appaloosa rider in America for 5 years," she remarked. She also led in stakes victories and topped the riding standings at fair meets in Northern California in the 70s. Cheryl White's career was not short of rewards. In 1990 she was presented an Award of Merit by the African American Sports Hall of Fame, in Sacramento, California. That same year, the California Legislature Letter of Recognition, Sports Award, and the Award of Merit. 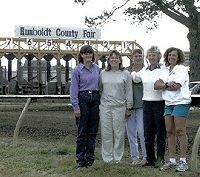 Humboldt County Fair racing office....Vicki Layne (paymaster), Dee Robinson (racing secretary, daughter of late jockey Jack Robinson), Lisa Jones, (asst. secretary), Dolores Collins (clerk of the course, Don Collins wife, former Appaloosa trainer), and racing official Cheryl White. Photo courtesy of Cheryl White. In 1991, Cheryl passed the California Horse Racing Board's Steward Examination. She has since served as a racing official at various California tracks. Pioneering jockey and racing official Cheryl White has been largely forgotten by major racing entities. At a symposium of pioneering female riders at the Kentucky Derby Museum, she was not invited. Though a member of the Jockey's Guild, she was never featured on any jockey cards of any year. There was an award winning documentary on African Americans in Racing, produced in Lexington some years ago, Cheryl was not in the video. She was also excluded from the special edition collection of African American Jockey Cards. 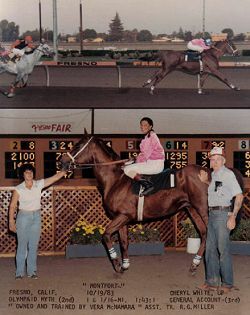 Cheryl White was not ignored, however in 1994, when awarded "Successful African Americans in the Thoroughbred Racing Industry" by the Bluegrass Black Business Association in Lexington, Kentucky. Then was honored by the National Girls and Women in Sports Day, presented by the AAF, Amateur Athletic Foundation of Los Angeles, California, 2006. In 2006, her early years caught up to Cheryl when Harper's Ferry National Historical Park, West Virginia, recognized Cheryl White as a honored guest at their Centennial Commoration. Cheryl White will not be forgotten any more. Lexington, Kentucky is constructing a new park to honor African Americans in racing, and will name the park after Issac Murphy, they are delighted to include this special horseman, Cheryl White.